During May and June, ProTec instructors Jaime de la Puerta and I (Skanda Coffield) travelled to Madagascar to take part in a scientific expedition that focuses on learning about paleoecology and extinct animals by studying remnants of the past found in underwater caves. 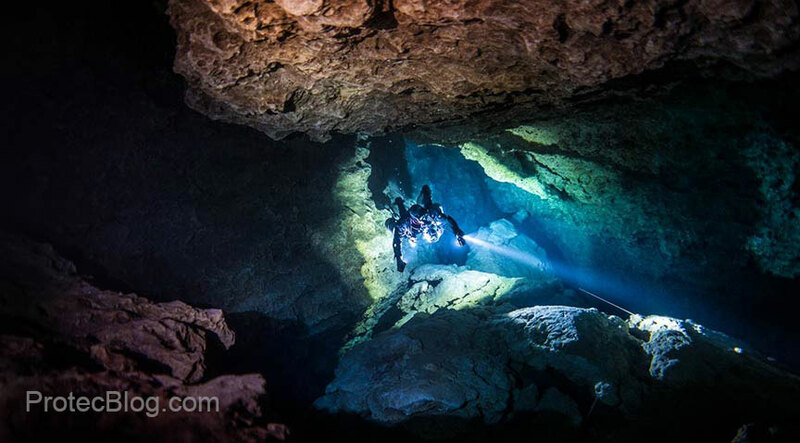 We were following in the footsteps of previous expeditions which Patrick Widdman and DRSS divers have been a crucial part for several years now (see ProTec friend and Dominican Republic Speleology Society Phillip Lehman’s Madagascar Karst Exploration Projectvideo). The 2018 expedition was led by researchers from the University of Massachusetts in Amherst, the City University of New York, and the University of Antananarivo in Madagascar. The science team consists of two disciplines, palaeontology – led by Dr. Laurie Godfrey and Zachary Klukkert – and geosciences – led by Drs. Stephen Burns and NickScroxton. Both teams were assisted by Malagasy graduate students Noramamy Rahantaharivao, Manjaka Rasolonjatovo, and Peterson Faina, and accompanied by professor Lovasoa Ranivoharimanana from the University of Antananarivo. The cave diving team was made up of Zachary (the only scientist-diver on the expedition), Ryan Dart (president of the Madagascar Cave Diving Association, original explorer of “Aven” aka “Vintany” cave, Australian, all round good guy and best cricket batsman in Madagascar), and Jaime and myself. The cave of “Aven” (aka “Vintany”) is littered with bones. In the sediment around the central debris cone countless skeletons lie buried under many layers of silt. At this site our goal was to support the mission to systematic collect and map these exquisitely-preserved “sub-fossils” (they have not fossilized, so they are very delicate). First off Jaime and I laid out transect lines from the existing cavern line so that we would have a clear reference of each of our excavation sites. With this information the scientists would be able to refer to a clear location for the bones collected. Zachary also took photographs of the cave floor to create a 3d model using a photogrammetry program, to create a 3d map to study the context of the bones and their distribution. We spent a few dives in Aven collecting fossils, which were then taken by the palaeontology team for preservation, cataloguing and study. For two days the team was involved in a documentary filming project, which will be part of a PBS special on evolution. The focus in Madagascar was on a species of extinct crocodile found only in Madagascar, the Horned Crocodile (Voay robustus). Dr. Evon Hekkala from the American Museum of Natural History (AMNH) is an expert on these crocodiles and arrived with the film team to learn about what these caves can tell us about the extinct Voay robustus. Amazingly, there only exist 5 fossils of this species in museums around the world, yet in the water filled caves of Aven, Amboley and Anjanamba, there are dozens of individuals represented by delicate skeletons. On the last day of filming in Aven, the team discovered the first juvenile specimen ever seen, there was a lot of excitement! The documentary will air in mid 2019 on PBS and has the working title Lineages. Some of the details of what were learned from this expedition are still under study, and will be released to the public in scientific journal reports before they can be reported here. However, what we can say, is that in this one expedition we succeeded in increasing the biodiversity of the animals that were previously known from these caves! In Aven, we found several species of birds that had not been discovered in previous expeditions. Also, in both Aven and Mitoho caves we found the remains of a bat, believed to be extinct, that has only been found in the very north end of the island before this year. Other important finds for the investigation of paleo habitats and the ecology of the cave systems include the discovery of remains of an (extinct) giant fosa (Cryptoprocta spelea) bones in Aven, which is otherwise rich with lemurs, and the bones of an extinct lemur (Pachylemur insignis) in Mitoho cave, which has many fosa bones but no other lemurs. This is new information for each site, as these animals had not previously been seen in those sites, and show an interaction between the ecology and inhabitants of these caves. Please consider donatingto help us build a museum to support and showcase this research. There will be a field season in 2019 in which ProTec will again be taking part… But to tell readers a little more about the 2018 expedition, Jaime has another little read coming up about Madagascar, diving logistics and the caves. On behalf of my fellow scientists working on this project, I want to express my immense gratitude to Protect Dive Centers, to Patrick, Jaime and Skanda for their hard work, professionalism, and dedication to advancing our understanding of the Natural History of Madagascar. Great report Skanda, looking forward to more news on the project, must have been fascinating diving there, well done on the success of the mapping and retrieval’s.